You are here:HomeNews & EventsDrama on King Street! 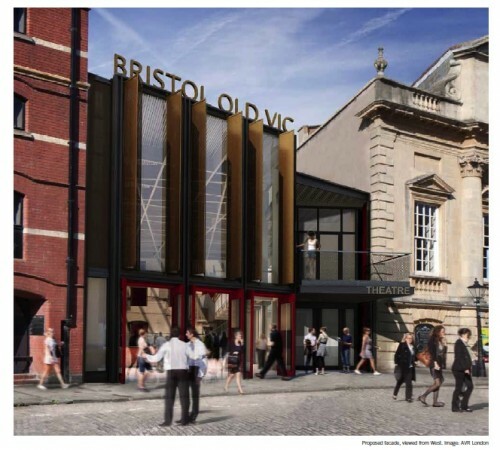 Major Planning and Listed Building Consent applications have recently been submitted for the Theatre Royal in King Street that would see the early 1970s alterations by architect Peter Moro swept away, to be replaced by a modernistic addition. Echoing in some ways the previous Edwardian entrance, these latest proposals by London architects Haworth Tompkins would radically transform the functions and circulation patterns of the front of house arrangements and include the relocation of the Young Vic studio theatre as well as the restoration of the banqueting room in the adjacent Coopers Hall. However, it is likely that the proposals for the new King Street facade to the enlarged foyer will stimulate the most debate. Black framed, extensively glazed, with its upper levels clad with perforated copper folding screens and with a triangular projecting metal and glass balcony, it would certainly be a controversial addition to King Street, described by Nikolaus Pevsner as “perhaps the most rewarding street in Bristol”.